If you're one of the millions of americans who have trouble getting restful, quality sleep each night, then you're probably desperate for a solution to this problem. Most people resort to prescription sleep medications or over the counter sleeping pills, but that's not always the best idea. You should start slow, and take advantage of natural remedies first before you jump into the pharmaceutical deep end. One such natural sleep aid, Restorol, contains a solid list of ingredients that can help you get the healthy, restorative sleep your body needs to function at its best. What Makes Restorol Stand Out? One of the best things about Restorol is the fact that it has a stellar list of effective ingredients. Most of these herbal remedies have been used for centuries to help people fall asleep, from the royals of medieval Europe to the noble farmers working in the fields. Many of these botanicals have a mountain of scientific evidence to support what natural medicine experts have known for many years: that these plant compounds are some of the most effective at relaxing the mind and eliminating stress so that you can get your best possible sleep. First, there's melatonin. This is one of the most important ingredients on the list, especially in modern times. Humans are being bombarded by electronic blue light well into the evening hours, and it's throwing off our body's natural sleep cycle. It tricks the mind into thinking that the sun is still up, and that it isn't time for bed yet. Obviously, this can lead to restlessness, difficulty falling asleep, and difficulty staying asleep throughout the night. But supplementing with melatonin is a great way to restore your body's natural sleep cycle. Next on the ingredients list is GABA. In the body, GABA is a neurotransmitter that helps the brain feel calm, relaxed, and stress-free. Unfortunately, the less GABA you have floating around in your brain, the more stressed out and anxious you will feel. By putting more GABA into your system, you'll be helping your brain relax at night so that nervous thoughts don't keep you awake. In order to boost the effects of GABA, Restorol also contains lemon balm extract and l-theanine. Both of these natural compounds prevent an enzyme called GABA transaminase from depleting GABA from your brain and making you anxious. L-theanine isn't the only amino acid in the mix that can help you with sleep problems. There's also 5-HTP, which is a precursor to two very important compounds: melatonin, and tryptophan. Tryptophan, as you might know, is a hormone that makes you feel incredibly drowsy after a large, high protein meal. And, of course, we've already discussed the wonderful benefits of melatonin. 5-HTP can help your body make more of it, Especially if your levels are abnormally low. Hops aren't just for crafting beer anymore. Extracts from the hops plant have been proven to help people just like you relax at any time of day. Herbalists have used hops to treat insomnia, restlessness, and anxiety problems for as long as herbal medicine has existed. Even in the olden days of very early farming, people would notice that fieldhands harvesting the hops had a bad habit of falling asleep on the job. Clearly, there's no debate as to the effectiveness of this plant. Last, but not least, we have chamomile and passion flower. These two ingredients are usually prepared in tea form and, even when taken separately, have some potent calming and relaxing effects. Putting them together in the same herbal sleep aid formula makes a lot of sense. After all, if they're so powerful when used alone, then taking them together would naturally compound their effects. That, plus the other effective herbs and amino acids in the Restorol formula show that the manufacturers of this product have a pretty good idea what they're doing. Do I Have to Worry About Side Effects With Restorol? Unless you have a known allergy to any of the ingredients on the Restorol label, then you don't have to worry about any unpleasant side effects from this herbal sleep aid. The manufacturer has designed Restorol with your comfort and safety in mind. You can rest easy knowing that you're not just taking an effective sleep aid, but also one which has been specially formulated to be gentle on your system. Is Restorol Sold in Stores? No, Restorol is not for sale in any drug stores or other retail outlets. But this is a good thing for you, the customer. You see, when people sell their products at retail stores, that store charges a markup on the final shelf price of the product. This is so that they can make money and, essentially, profit off of you. 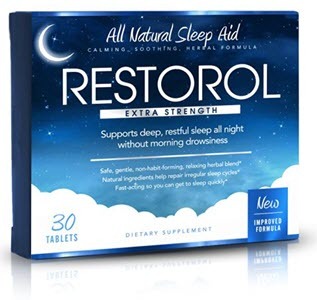 Since the manufacturers of Restorol want to make sure you get the best herbal sleep aid available for a fair price, they sell it online through there virtual web portal. Right now, there's a discount available for new customers: you could save as much as 62% off your first order, which is a pretty exciting deal! The only problem is that quantities are limited, so the best thing to do is to act fast and claim your discount before the supply runs out. Will Restorol Really Help Me Sleep Better? From what we can tell, It seems as though Restorol is definitely one of the more effective herbal sleep aids on the market today. The list of active ingredients hits all of the right keys when it comes to promoting healthful, restful sleep. The ingredients are all-natural and safe, so you don't have to worry about the nasty side effects you might encounter with chemical sleeping pills or prescription drugs. Furthermore, the fact the manufacturer offers a solid money back guarantee and a steep discount for new customers (for the time being, at least) shows that they have a lot of confidence in their product. After careful review, we definitely think that Restorol is worth trying out. You can take a closer look at Restorol - and similar products - on our reviews homepage.